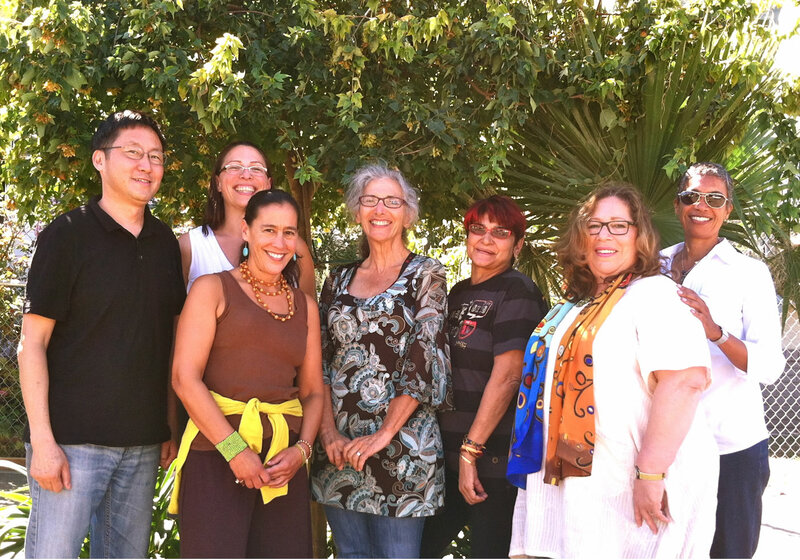 From left to right Gordon Mar, Maria Poblet, Julie Quiroz, Gilda Hass, boona cheema, Maria Elena Guillén, Denise Perry. NTanya Lee not pictured. boona cheema is a native of India who immigrated to the united states in 1971. She joined Building Opportunities for Self Sufficiency as a client, then as staff, and as its executive director, in 1978. She lead the organization’s work to aid and empower homeless people and families, and in fighting for comprehensive long-term solutions to homelessness. boona has impacted dialogue and policy on global disparities, focusing on income, housing, health and engaged community development in the pursuit of equity, at local, regional, statewide, and international levels. In 2013, boona left BOSS to continue her social justice work, write children’s books and develop boonachepresents, a business adventure dedicated to justice, wellness, and spirituality. Michelle Foy Michelle is currently the Program Manager at RoadMap, an intermediary that provides capacity building and organizational development support to social justice organizations across the country. Maria Elena Guillén has worked within the public sector in the field of aging for over twenty years. As a Program Analyst for the San Francisco Department of Aging and Adult Services, she liaisons with several non-profit organizations offering an array of services so elders and people living with disabilities can age in place with dignity and independence. For past two decades she has been a union activist, serving as a shop steward, mentor and union officer for the Service Employees International Union Local 790. She currently represents SEIU 1021 on the San Francisco Labor Council. A strong advocate for building community and labor power, she is active in Jobs with Justice SF. Gilda Haas is an educator, organizer, and urban planner, who in past lives has helped start a credit union, a land trust, and numerous organizations (including SAJE, Strategic Action for a Just Economy, and the Right to the City alliance, where she first encountered Just Cause) — all towards building a more fair and democratic economy. She taught in UCLA’s Urban Planning Department for many years where she also started their Community Scholars Program and presently divides her time between teaching in Antioch University’s Urban Sustainability program; Dr. Pop, her alter ego and popular education web site; and coaching the next generation of leaders for a new economy. NTanya Lee With a family history of activism and childhood roots in the Black working class of Cedar Rapids, Iowa, NTanya has spent thirty years working for social justice. Politicized by her experience of poverty, public assistance programs, and her mother’s resistance to the daily blows of oppression, NTanya spent her teenage years organizing her peers against Ronald Reagan’s military aggression and attacks on poor families. She organized for racial and gender justice as a college student, and started the first LGBT student of color organization on campus. In the early ‘90s she was active in grassroots, racial justice school reform campaigns, and was a member of Black AIDS Mobilization. In both New York and Michigan, she organized progressive alliances between working-class Black and Latino community organizations and white-led LGBT groups to fight a wave of anti-gay initiatives pushed by the Religious Right. For eleven years she worked with Coleman Advocates as a youth organizer and then Executive Director to build the power of Black and Latino families to win education, housing and budget justice in San Francisco, California. NTanya and her partner Ayoka are raising their five-year-old in the Bay Area. Gordon Mar is a longtime Bay Area social justice organizer and activist. He currently serves as Executive Director of Jobs with Justice San Francisco, a strategic alliance of community and labor groups working together to build the economic justice movement locally and nationally. Gordon has previously served as director of San Francisco’s Chinese Progressive Association, the Northern California Citizenship Project and the Bay Area Environmental Healthy Collaborative. He and his family live in San Francisco. Denise Perry has been dedicated to developing strong grassroots leaders, through organizing and training over 29 years of labor and community organizing. She has been on the creator team of many efforts over the years such as Organizing Institute, Women’s Global Equity Project with international labor affiliates in Africa and the Caribbean to train and work with women activists, and the Right to the City Alliance. In 1999, Denise co-founded Power U Center for Social Change, rooted in Miami’s historically Black community of Overtown. Power U has equipped residents to challenge the displacement of low-income families by gentrification. She was a recipient of the Bannerman Fellowship, and current serves on the board of Power U and the Louis E. Burnham Award Program. Today she is leading the Black Organizing for Leadership and Dignity (BOLD) project providing leadership training for Black Organizers and directors nationally. María Poblet is the Executive Director of Causa Justa :: Just Cause. She is Chicana and Argentine, and has more than a decade of experience in Latino community organizing in the Bay Area. At St. Peter’s Housing Committee, María was instrumental in transforming a service provision model into a membership and organizing structure, and a grassroots leadership development and political education program. In 2009, she helped lead the merger between St. Peter’s and Just Cause Oakland that created Causa Justa :: Just Cause. She is a leader in grassroots movement building work, including the Grassroots Global Justice Alliance. Maria had the privilege of being mentored for many years by June Jordan, is an avid writer, and was the Artistic Director of Poetry for the People before she fell in love with community organizing. Julie Quiroz is dedicated to discovering, generating, and telling powerful stories of social change. As a Senior Fellow at MSC, Julie has played a leadership role on MSC publications and communications, as well as in developing and launching specific projects such as Our Healthy Alliance (a collaboration with RoadMap). Julie is the editor of MSC’s blog, and serves on MSC’s Forward Stance facilitator team. Prior to MSC, Julie served as a Senior Program Consultant to the Akonadi Foundation and co-founder (with Daniel HoSang Martinez) of mosaic consulting, where her clients included The Ford Foundation, The San Francisco Foundation, and the Greater Washington Regional Foundation. Julie’s organizational experience includes Center for Third World Organizing, Northern California Coalition for Immigrant Rights, Urban Habitat, and National Council of La Raza. Julie serves on the board of the Philanthropic Initiative for Racial Equity. Julie’s writing includes: Echoing Justice: Communications Strategies for Community Organizing in the 21st Century, Five Lessons From the Past and Present of Racial Justice Organizing, Beyond Green Jobs, and Let Freedom Roll.